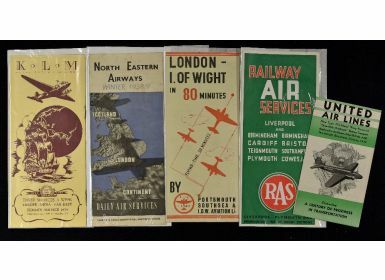 Aviation Collection of Five 1930s Brochures – to include United Air Lines 1933. Three-fold Brochure published specially for their display stand at the Chicago World Fair of that year with two illustrations of their then new Boeing Monoplane aircraft. 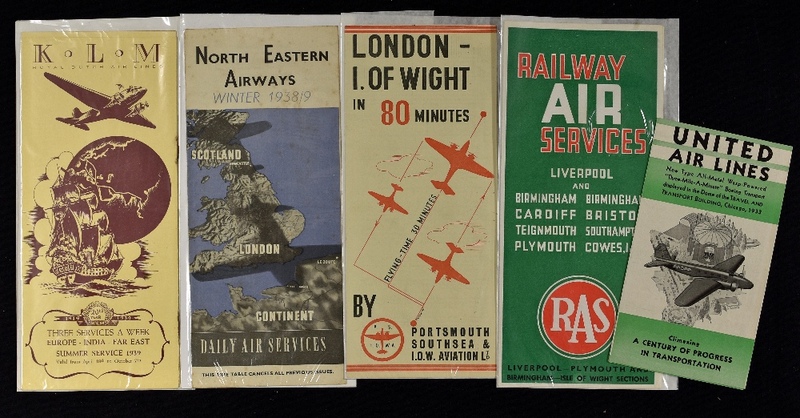 Folds out to size 10¼” ´ 6¼”, Railway Air Services. July 1934. A fold out 7 page time table giving times of Flights on the Liverpool – Plymouth Route and the Birmingham Cowes Route and Fares etc. Also with Photograph of one of their aircraft. Printed in Red, Green and black, size 4” × 9” folded. Portsmouth Southsea & I.O.W. Aviation Ltd. 1936. With two photographs of their then modern monoplane aircraft and map Fold out 6 pages detailing times of departures arrivals, fares, information etc. Size 3¾” ´ 8½” folded. North Eastern Airways. Winter 1938/9. A fold out 8 page time table, with fares and details from London Croydon to Leeds, Newcastle and Scotland. Folds out to 15” × 8¾”. K.L.M. Amsterdam –Batavia. Summer Service 1939. A 12 page publication with 3 photographic illustrations of their aircraft. Also with map, time table, fares etc, text in English. Printed on semi-gloss paper in brown and cream. Size folded 3¾” × 8½”.